I've been a long time reader of Alexandra Stafford's blog. In fact, we probably cook from it at least once a week. So when her book, Bread Toast Crumbs came out last month, it arrived in my mailbox with not a minute to spare. I've been wanting to be the type of person who bakes my own bread for a while now but unfortunately this whole grad school thing was not allowing that to happen. This cookbook has showed me otherwise. The recipes are simple and fairly quick and make me wonder why it's taken me so long to make homemade bread on a weekly basis because fresh out of the oven it's just such a game changer. This bread is adapted from one in her book and it teeters on the line of being borderline too decadent. Creamy chocolate ganache with bursting juicy berries swirled together in a barely sweetened loaf that's all too unassuming until you cut it open and BAM - what dreams are made of. My dreams, at least. And somehow it's dairy and egg free. I seriously don't know how that happened but it wasn't hard at all. Of course you could go ahead and use whole milk in the dough and butter in the ganache, but I've replaced them both with coconut milk to keep that fat content and creaminess factor high. Honestly, you'd never know the difference, plus that subtle coconut smell as you're mixing up the ganache is quite intoxicating. So maybe make this for your mother on Sunday, maybe make it for yourself and eat the whole thing in 24 hours, maybe bring it to brunch. Either way, food is love, and everyone will love you. Make the dough. In a large bowl combine the flour, salt, sugar, and yeast. Whisk to combine. In a small bowl, combine the coconut milk and water (both boiling & room temp). Pour the wet ingredients into the dry followed by the coconut oil. Use a rubber spatula to mix everything until it forms a cohesive dough. Cover with a towel and set in a warm place to rise for 1 1/2 hours or until the dough has doubled in size. While the dough is rising make the ganache. Place the chocolate and coconut milk in a double boiler over simmering water. Stir constantly until the chocolate begins to milk, then stir in the powdered sugar. Keep stirring until the chocolate has melted completely. Remove form heat and set aside to cool completely. Grease a standard 8.5 x 4.5 inch loaf pan generously with vegan butter. Once the dough has risen de-flat it with a fork and transfer it to a heavily floured work surface. With floured hands shape the dough into a ball (it should be very covered in flour at this point) and let sit for 20 minutes uncovered. Gentle shape the dough into a 10 x 15 inch rectangle (using either your hands or a rolling pin). Make sure you have plenty of flour underneath your rectangle so it doesn't stick to the surface. 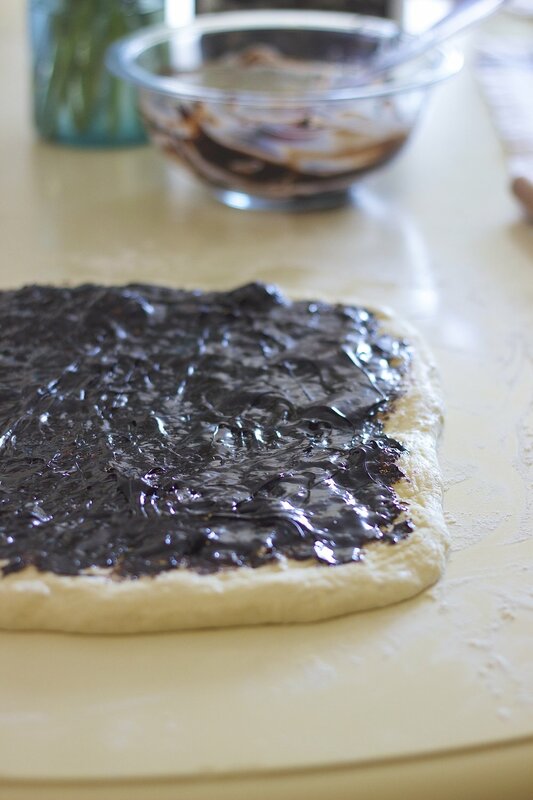 Spread the ganache all over the top of the dough, leaving a 1/2 inch margin on all sides. Top with berries. Roll the bread from short end to short end into a thick 10 inch log, seam side down. Take a deep breath (you've got this!) and transfer it your buttered loaf pan. Preheat your oven to 375 degrees F, while you let the dough rise for about 10 minutes until it just begins to crown the rim of the pan. Cook the bread for 40 to 45 minutes until the top is golden and firm. Remove from the pan and turn onto its side to cool (I let it rest on 1 side for 10 minutes then the other side for 10 minutes) before cutting into it!